AsÂ Americans inexperienced in the art of “noodling,” our hands-down favorite ramen in the world for many months nowÂ has beenÂ Shin-sen-gumi.Â It has been a tradition for awhile now; I would estimate we have eaten Shin-sen-gumi ramen on average at least once every two weeks.Â And so we met his parents there. UntilÂ I had my atypicalÂ morning foodie epiphany, that is.Â I was shocked, actually, with the realization that last night, I had not experienced the sameÂ fuzzy feeling when I tasted that extra-delicious pork brothÂ at this familiarÂ venue.Â Â Where hadÂ they gone wrong?Â What could have happened with my rich broth and soft curly noodles?Â And then I realized that it could only be one thing. 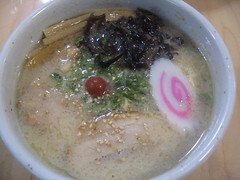 I had tasted ramen from Santouka. 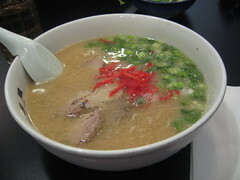 Santouka, which is located inÂ the Mitsuwa Japanese Market food court (West LA and Torrance),Â was even better.Â Perish the thought that the Shin-sen-gumi have been dethroned.Â Alas, it was true.Â The shio broth ramenÂ at Santouka, recommended byÂ my friend J and the Rameniac himself,Â was indeed even more flavorful.Â Also interesting to note, the noodles areÂ firmerÂ hereÂ as Rameniac has enlightened me that Santouka ramen,Â Â from the north part of Japan,Â is actually a whole different type of ramen from the Hakata kind Shin-sen-gumiÂ offers, which is softer.Â Clearly, when it comes to ramen, I have a lot to learn! Warning: Typically closes at 7:30 pm!! This entry was posted in Food, San Gabriel Valley, West L.A.. Bookmark the permalink.